What do Kelly Rowland, Naya Rivera, Kaley Cuoco, Katie Couric, Molly Sims, and Jessica Alba all have in common? They all have a cushion cut halo engagement ring! This style has become increasingly popular during the past two years and is one of our best-selling engagement ring styles. 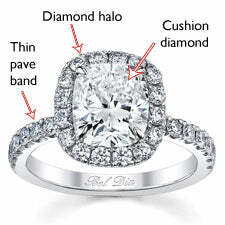 Here’s the basic breakdown of this cushion cut halo engagement ring style: 1) a thin diamond pave band, 2) a sparkling diamond halo, 3) a cushion (“pillow”) halo shape, 4) a gorgeous center diamond, preferably a cushion cut diamond, although you can also use a radiant diamond or any rectangular or square diamond shape for a similar look. We’ve even had clients use a round diamond for a very distinctive take on this style. All the celebrities here wear the style with a white metal, such as 14k white gold, 18k white gold, palladium, or platinum. Visually, these metals are indistinguishable from each other, and all have their pros and cons (see our metal information page for details). We also offer them in yellow gold or rose gold for a unique twist. 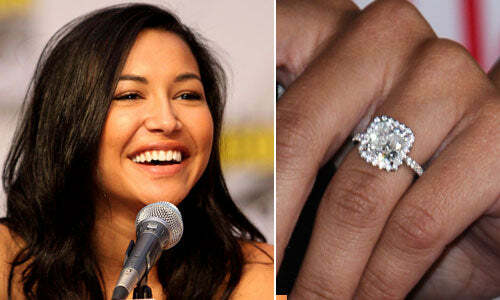 Without further ado, here are the celebrities and their rings! Jessica Alba met Cash Warren in 2004, and the two got engaged in 2007. Molly Sims wears a cushion cut engagement ring designed by Diane von Fürstenberg and her now husband Scott Stuber. Katie Couric got engaged over Labor Day weekend in 2013 to John Molner with this cushion cut engagement ring from New York jeweler Stephen Russell. Kaley Cuoco wears a cushion cut engagement ring from Red C Jewels, presented to her by her now husband Ryan Sweeting. Naya Rivera and Sean Anderson, a.k.a. Big Sean, announced their engagement in October 2013. Kelly Rowland was proposed to via Skype, but Tim Witherspoon soon followed up with a cushion cut engagement ring. If you’re looking for a cushion cut halo engagement ring, deBebians offers many styles and designs as well as the ability to customize any setting or create an entirely new design for you. If you’re interested in reading more about these celebrity engagements, please check out our celebrity engagement rings page.